I saw my friend eating this Asian snack, either Japanese or Chinese, which I've seen before in those Asian markets. It is hard to describe, but it looks like a ball of dough, with a clearish color. It is not cooked, and it is not a dumpling. Inside the ball, there is some jelly substance with nuts. It's quite a strange food. Based on your photo, this is most likely a wagashi (Japanese sweet) called daifuku in Japanese. It's got an outer layer made from cooked glutinous rice that has been pounded and kneaded aggressively until smooth, which is called mochi. 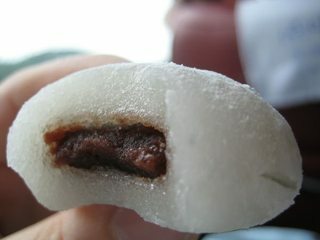 The inside is often a red bean paste made from a bean called azuki in Japanese (or adzuki in an odd English-language spelling from circa the 1970s) and sugar. The bean paste is called anko (or sometimes just an), pronounced ahn-ko. Variations in the exterior include flavoring with yomogi (mugwort), which turns the color greenish, or the addition of other colorants. The filling may be made from other beans such as white beans (shiro-an), green peas (uguisu-an), edamame (zunda), and so on. There are variations made in Korea and China as well. Not the answer you're looking for? Browse other questions tagged asian-cuisine food-identification or ask your own question. Can anyone identify this Chinese candy?